» no.4 Kommt fein's Liebchen heut? Although highly productive and respected in his lifetime as a composer of Lieder, Robert Franz (1815–92) has since become a peripheral figure in music history. One reason may be that he avoids dramatic contrasts and instead aims at an emotional ambiguity: ‘My representation of joy is always tinged with melancholy, whilst that of suffering is always accompanied by an exquisite sensation of losing oneself’, he once wrote to Liszt. As a consequence his music appeals to those who are able ‘to admire the nuances of a charcoal drawing without longing for the colours of a painting’, to quote from Georges Starobinski’s liner notes to this recording. As they began to explore the songs of Franz, Starobinski and the baritone Christian Immler were moved by their findings to devise a programme which includes 23 of the composer’s often quite brief songs. Using the poet Heinrich Heine as their guiding star, they present these – all Heine settings but from different opus groups – in the form of two ‘imagined’ song cycles. These are framed by further settings of Heine poems – by Schumann and Liszt, who were both staunch supporters of Robert Franz – providing not only contrast, but also the opportunity to discover how these three very different artistic temperaments treated the same material: some poems appear in more than one setting, notably Morgens steh’ ich auf und frage and Im Rhein. 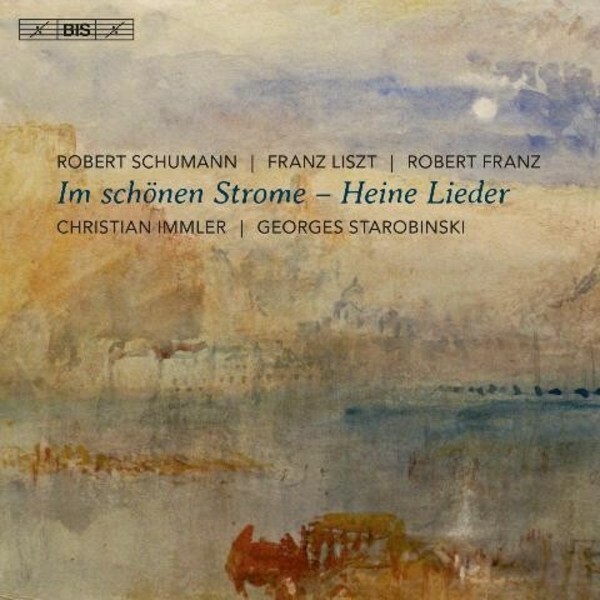 The Rhine, which played such an important role in the Romantic imagination and in Heine’s poetry, also runs through the programme, from Schumann’s celebrated song cycle Liederkreis, Op.24, to Liszt’s dramatic scena Die Loreley, and has given name to this album: Im schönen Strome (‘In the fair river’).